The Hotdoggers Longboard Surf Club is based at Saunton Sands, North Devon, but boast members from all over the UK. The club won Surf Englands club of the year in 2018. Although an active long boarding club it also boasts a SUP division and has been running between three and four contests with a SUP division every year, culminating in the club awards night in November to present trophies for the winners and talk surfing at the bar. The events are held at Saunton beach with its long righthand waves and shorter but equally fun lefts. The vibe at the contests is super laid back, with most of the SUP surfers also competing in the long boarding as well. 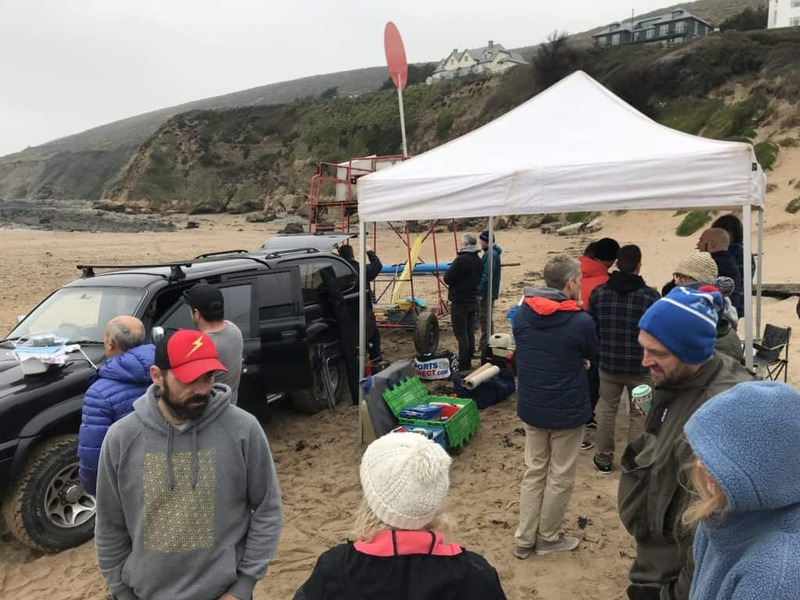 Hotdoggers March 30th surf contest 2019 – checking in. 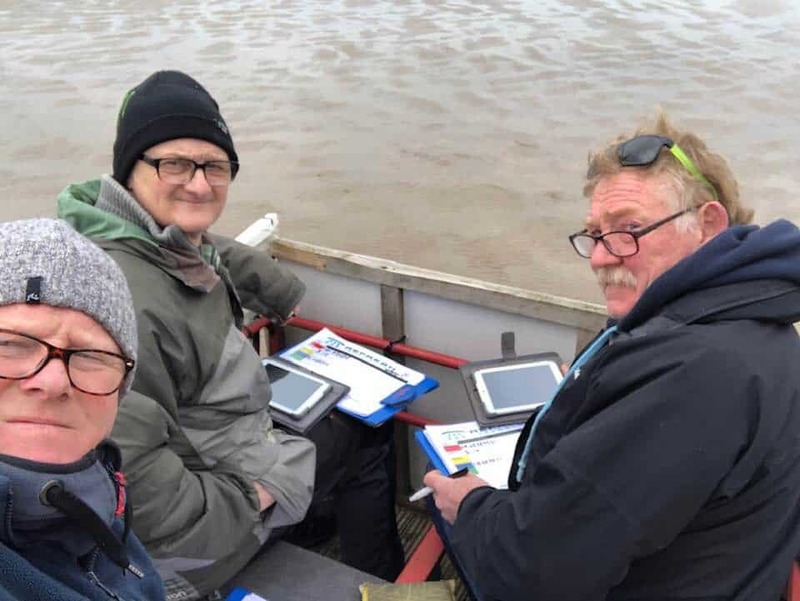 The first contest of the year was held on 30th March 2019. 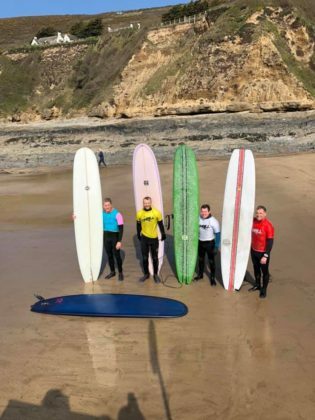 It was a last minute call as the surf forecast was small, but club president Norman Wright asked the members via the Facebook page whether we should go for it and a big ‘yes’ came back so it was on! It was a great decision as we had perfect clean 2ft waves and the sun came out. The SUP went in first, straight into the final as only myself, Sean Facey and Steve Pye had entered (some of the regulars were away at the GB SUP race in Nottingham). 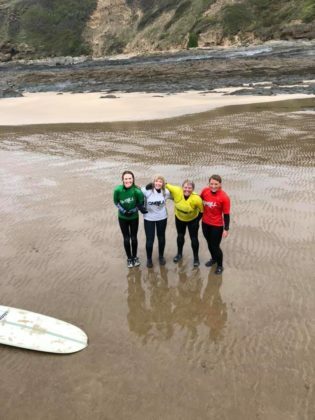 We got into the water at 8.50am but the judging tower didn’t arrive for another 30 minutes, so we had beautiful waves to ourselves until they did! Steve Pye was riding a 9ft Starboard longboard shaped SUP, watch out for a longboard division in SUP contests this year! Sean and myself rode short board style SUPs. Sean is between boards at the moment, waiting his new one to be glassed, so he borrowed my Diplock 8ft and I rode my JP 7ft 10. 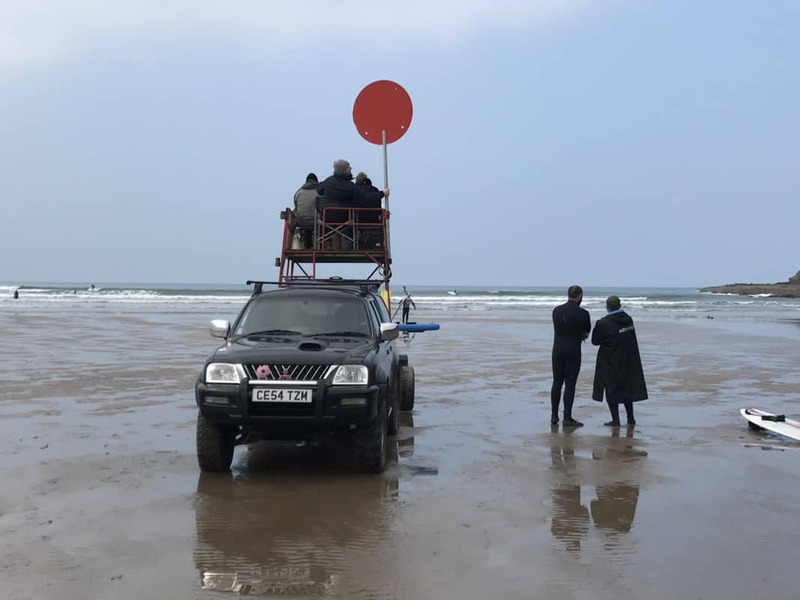 The judges and the tower arrived (towed by the new club vehicle, good to see it in the flesh at last) and the heat kicked off. Norm, Dre and Graham were using a new electronic system for judging, which was brilliant – they put the scores into tablet PCs and the scores went straight out, live, onto the internet. 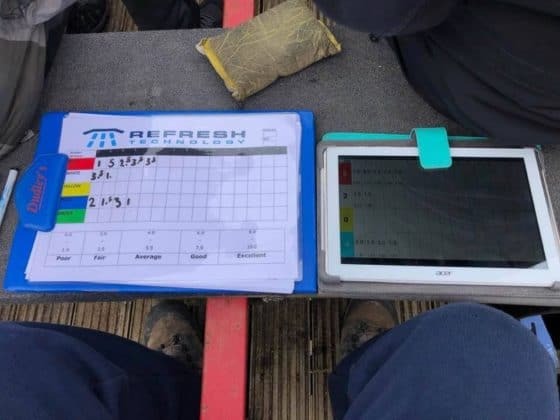 It’s a great system and I believe we will be seeing it at BLU and hopefully BSUPA events this year. It should be said all the judges are ISA qualified and often judge at different events all over the world. Hotdogger Judges Norm, Dre and Graham. We were lucky to get such great waves and it was one of those heats where you can just go for it and surf for the love of it. I had a couple waves I was happy with so decided to have a dig around for some waves that I could take some risks on, Sean had also had a couple of really nice waves. Steve was getting some really long, smooth waves on his 9ft, really it was just fun surfing with friends. In the end I managed to win the heat, but only by 0.8 of a point, with Sean in second and Steve third. Next up was the open long boarding, which Sean entered, then the masters which I entered (and had a shocker in). We also had a single fin division later in the day. 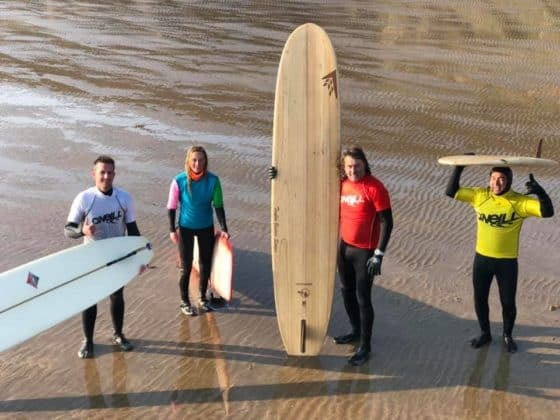 There was some amazing longboard skills on display with Jersey resident Ben Haworth flying in to compete and taking the win in the open and the single fin, Paul Keenan winning the masters, Rich Unsworth taking the Grand Masters and Jen Pen winning the ladies. 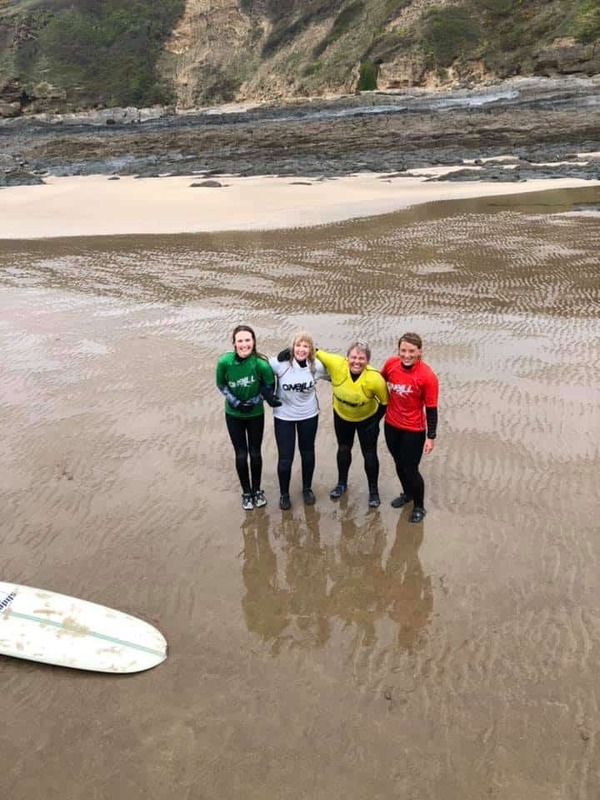 Special mention goes out to Beth Leighfield from Bude who got second place in the open, the single fin and the ladies (yes men and women compete in the open, and the women frequently smash the men, both Beth and Jen made the final). Beth, Jen and SUP legend Tina Beresford are currently out in Spain competing in the WSL LQS Longboard Pro Espinho so best of luck to them! If you would like to come and take part in one of the friendliest contests and be part of a great club get in touch with the Hotdoggers on Facebook or visit the Hotdoggers website. The dates for the next contests in 2019, subject to conditions, are 13th-14th April, 14th July and 7th-8th September. All held at Saunton Beach, North Devon. 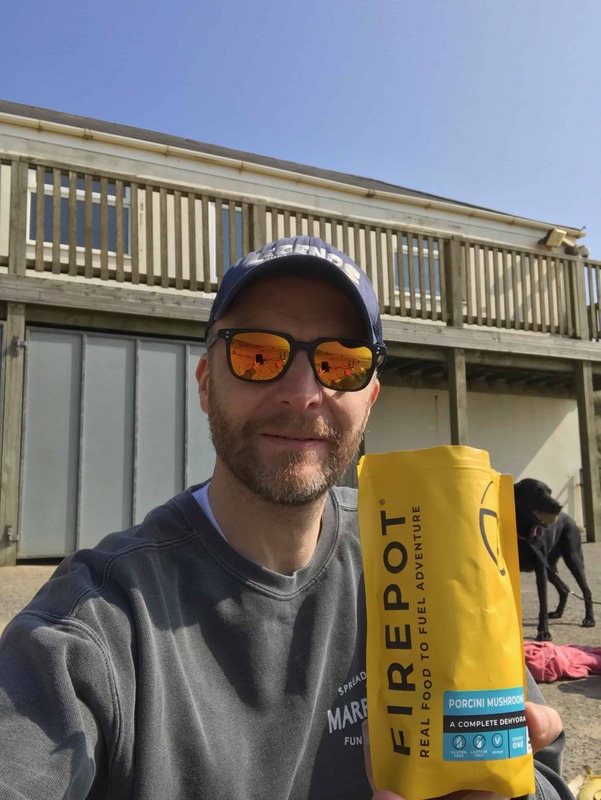 Thanks to my sponsors Tiki Wetsuits for keeping me cozy and warm, Moonshine Eyewear for keeping the sun out of my eyes, FCS for my awesome fins, Married to the Sea clothing for the cool threads, Firepot food for the lush lunch and 2XShttps://www.2xs.co.uk for all my other SUP needs.